We all get into ruts. From the stuff we watch on TV to the food we put on our table each night, there are definite patterns we fall into and sometimes it gets boring. In fact, as the weather turns harsher and we spend more time at home, I find that I start watching the same shows and eating the same meals over and over. Luckily, we live in a region where the variety of restaurants serves to jolt us out of our boring ruts with fun, tasty options in settings that are comfortable and fun. One such place is the Vine Brook Tavern in downtown Lexington, MA. My wife and I were guests of the Tavern the other night and here’s how they effectively entertained us and our tastebuds. First off, they took us on a tour of the restaurant. Two floors and lots of seating belie the facade at 20 Waltham Street in Lexington. While the restaurant seems to be a simple, flat storefront, the building goes far enough back to house a large bar, enormous kitchen, upstairs function rooms and plenty of seating for anyone looking to sample some great food. According to owner Marcus Palmer, the location was actually a US Post Office – the second one in Lexington in the early 1800’s. Therefore, the management decided to maintain the building’s decor and the outdoor paint colors were carefully chosen as they are similar to the look the building had back in the 19th century. Classic touches are all over the venue, from lamps made with metal barrel rings to the flags hanging in the front windows. All of it lends a comfortable family feel to the restaurant, as if it’s the place where the whole town might gather on any given evening to meet friends and enjoy a good meal. 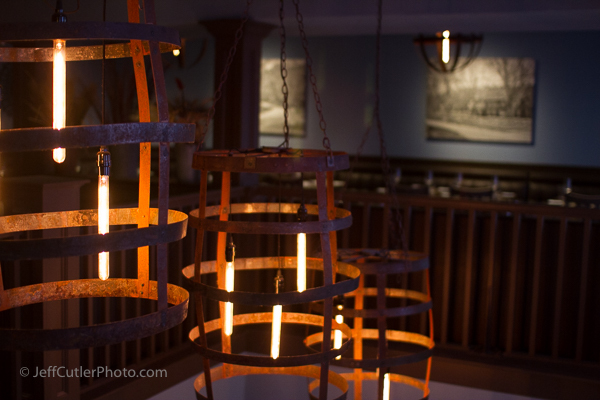 Lamps are made with the metal rings from authentic wine and whiskey barrels. 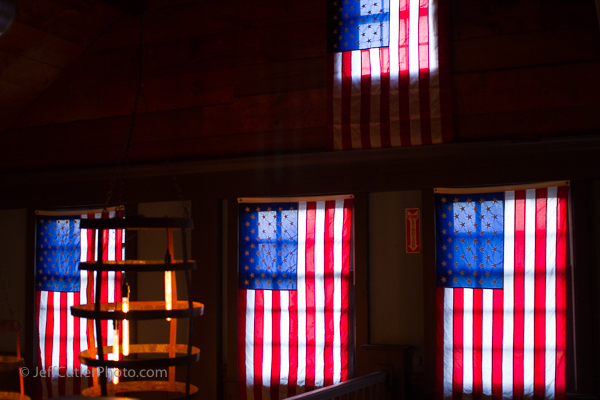 Flags adorn the windows inside Vine Brook Tavern. There are also a bunch of more contemporary touches like artwork on the walls, comfy booths and large tables, and a trio of chalkboards touting current beer offerings, social media handles and dinner specials. One of the coolest touches was seeing photos of downtown Lexington on canvas. It turns out that Palmer commissioned a photographer to run around town on the actual day of the restaurant’s opening and take photos to document exactly how the town looked on the first day of business. 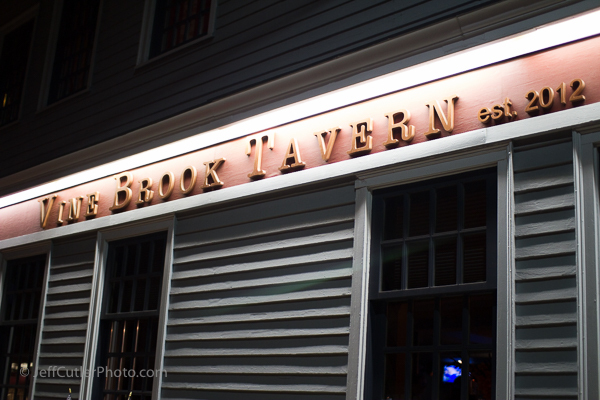 Photo taken on Vine Brook Tavern’s first day of business in 2012. Thoughtful touches didn’t end there. The food – what we were really there for – was coordinated, tasty and of a huge variety. Our meal included a few comfort offerings like the calamari fries, the seafood pot pie and a pork dinner. The chef sent out tasty pork dumplings and we washed it down with a splendid red wine and a tasty stout. Side dishes were of generous size and the selection changes regularly depending on what fresh ingredients are available. In fact, we were so full we didn’t even order dessert – but I had my eye on the creme brulee and the pear crostada. They also have lava cake, bread pudding, ice cream and fresh berries as options. Definitely something for us to look forward to the next time we visit. 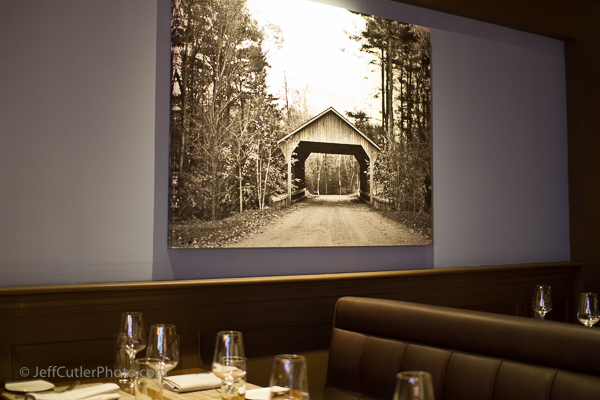 Ultimately, Vine Brook Tavern was created with a vision to making people feel welcome. The food, space and staff did just that and next time we’re in town we know where we’re going. I’ll leave you with Marcus Palmer explaining how management sees the restaurant and a link to getting in touch if you find yourself in scenic Lexington, MA.